Welcome to the Eden Condominium rentals in Perdido Key, Florida! 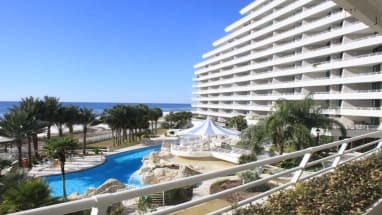 This unique complex offers million dollar views of the gulf, impeccable amenities and unbelievable architecture for your next Perdido Key vacation! Perdido Key allows you to relax on your vacation and get away from the more crowded areas along the Gulf. Eden Condos sit directly on the white sandy beaches of the Florida Gulf and are conveniently located in the middle of major cities such as Destin, Florida and Gulf Shores, Alabama. Eden Condos offer many amenities and activities along with fun things to do on your next Florida vacation. Enjoy the miles of white sandy beaches with easy access then come back and relax by the beachfront pools and hot tubs. Get your work out in at the onsite state of the art fitness center or compete with your friends on the tennis courts. The complex also offers an in-house spa for the ultimate relaxation on your vacation. The area is fantastic and offers plenty to do outside the condo resort. Enjoy the yearly Blue Angels airshow, the Gulf Coast Paddle Championship or spend the night watching the local Blue Wahoo’s baseball team. ECBYO allows your to book Eden Condo rentals directly with the owner, giving you the best deal on your vacation rental. Each listing is equipped with an Email Owner button and phone number for your booking convenience.